What is professional depth coaching? Depth coaching assists clients dramatically reinvigorate their outlook on work and life while developing their life skills and unlocking their hidden potential. Though there are a number of similarities between depth coaching and psychotherapy, coaching is not psychotherapy. Psychotherapy primarily treats mental illness and various kinds of pathologies that tend to originate in the past. One could also say that psychotherapy deals with healing pain, resolving past trauma, and improving relationships. Depth coaching, rather, is about maximizing a client’s performance so that he or she may better achieve the goals in the present and future. What is the origin of depth coaching? I accredit Patricia Adson for introducing the term “Depth Coach” in her 2004 book Depth Coaching, however, I have significantly expanded on Dr. Adson’s original conception of depth coaching, which was steeped in the work and theories of Dr. Carol S. Pearson. Who is depth coaching for? The short answer is for anybody who thinks he/she needs a fresh perspective on the circumstances of their life. A client’s issues can be as simple as feeling stuck somewhere in life or as complex as navigating an existential crisis. How does depth coaching work? Depth coaching seeks to explore and understand the whole person. It consists of a productive dialectic relationship between coach and client. Depth coaching recognizes that no two people are alike, thus, based on input from my clients I tailor their plan to best fit their work schedule, goals, and time available. As previously indicated, depth coaching does not focus on psychological problems per se, but seeks to develop whole person solutions through dialogue, client-collaboration, depth enablers, and problem solving. How does the program exactly work? The program starts with either a phone call (530) 746-8239 or an email. Once the prospective client expresses interest in depth coaching, I will schedule an appointment for his/her free 30 minute consultation. The initial consultation does not have to last 30 minutes, but it usually provides me sufficient time to assess the prospective client’s goals and determine whether depth coaching is right for him/her. 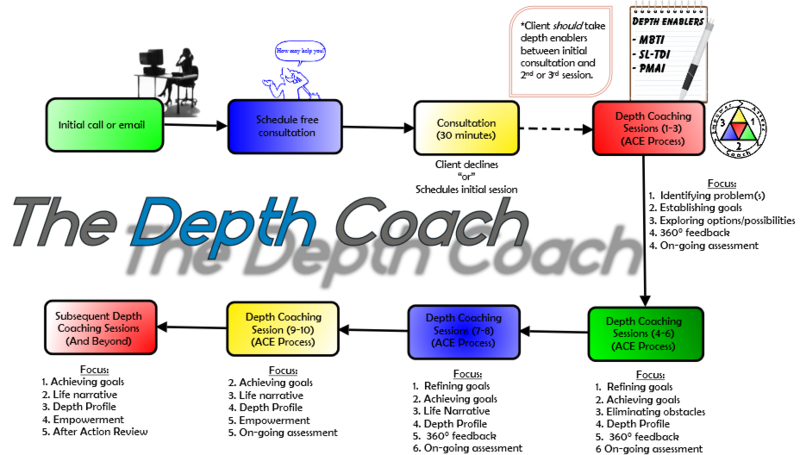 If we both agree that depth coaching is right for you, I will send you 1) an intake form, 2) depth coaching agreement, and a 3) questionnaire. The questionnaire helps me tailor the depth coaching program to your specific goals and interests. I will also send you instructions to log on to the appropriate website(s) to take the depth enabler(s) (MBTI®, PMAI®, SL-TDI™, etc.) that come with your package. I request that you take the depth enabler at least one day in advance of our initial depth coaching session so that I have sufficient time to evaluate the results and integrate them into your tailored depth profile. Each depth enabler should take no longer than about 20 minutes to complete. After you take the tests, I will review the results and submit to you a depth profile™ for your own records and use. Keep in mind that the MBTI® and PMAI® are merely indicators rather than surefire ways to map a person’s temperament and decision-making process. Though they are valid instruments, they are only accurate about 70% of the time. That is why I focus on redundancy and triangulation in order to increase accuracy and reliability. Your time and money are valuable and I don’t want to waste it so I will do everything I can to make sure you gain maximum value from our time together. See below for a comprehensive step by step articulation of of what the average person can expect to encounter throughout the depth coaching process. As I am employing the whole person model combined with my signature ACE coaching process, I recognize that diagnostic and analytic tools may help the client by revealing personal tendencies and patterns they exhibit, if even only at a subconscious level. Therefore, I highly suggest that my clients take the MBTI® and PMAI® prior to beginning. The SL-TDI™ is also available should the client show an interest in taking it as well. These depth enablers (i.e., instruments) are complimentary with the purchase of the bronze, silver, and gold packages. 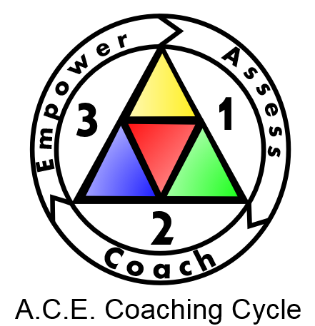 I have developed a three-point system to coaching which I have named the ACE coaching process. The ACE acronym stands for Assess, Coach, and Empower. One can better visualize this model via the diagram depicted below, which depicts a cyclic process that focuses on achieving and sustaining results for the client. Will depth coaching work over the phone or via Skype? Sessions are scheduled in 60 minute iterations. Every person has different needs and some people will need more sessions than others. I recommend to all my clients to start off with at least silver package since it can provide sufficient time to really make noticeable advancements towards the client’s goal(s). I tailor the hours around your unique objectives and aims, whether they are professional or personal. So it really depends on what you are trying to accomplish and get out of depth coaching. Most people find that they can achieve results within 4-10 sessions. Ideally, within about 6 sessions, a client can realistically achieve at least one benchmark of empowerment. For some clients, this will be enough whereas for others it will not. People often prefer to pursue depth coaching mainly on an “as needed” basis. In this case, a “single session” schedule may be your best option. What does your email support include? Email support consists of unlimited email access to depth coach for active clients. This option does not extend beyond the span of the sessions. In other words, as long as the person is an active client and enrolled in one of the packages email support is unlimited. Response times to emails will vary based on order of receipt of email. I would also add that one would be surprised how much can be accomplished via simple email exchanges between coach and client. We accept checks, money orders, Pay Pal, and credit card. All payments can be sent my mail or completed electronically in advance prior to the start of coaching sessions. Checks are to be made out to DeNovus Insights. Does the Depth Coach provide a money-back guarantee? If a client purchases a package and decides to abruptly cancel the scheduled sessions for whatever reason I will provide his/her money back at a pro-rated amount. For more information, a person can find this information under the Rates section. Keep in mind that each package varies in price and scope. I highly encourage my clients to at the very least enroll in bronze package as it is difficult to make any substantial gains in a one-hour session. However, I am flexible and can tailor the coaching plan to the needs and schedule of the client. What is a depth enabler? Is one of an assortment of tools that I employ to assist my clients to better align their life with their goals and aspirations. An enabler can be something as simple as 360° feedback or as formalized as the administration of a psychological inventory like the Myers-Briggs® Type Indicator. I also use the Pearson-Marr Archetypal Indicator® Instrument, the California Personality Index® (CPI®), and Singer-Loomis Type Deployment Inventory™ (SL-TDI™). What is the Pearson-Marr Archetype Indicator® Instrument (PMAI®)? The Pearson-Marr Archetype Indicator® (PMAI®) is an empirically tested archetype assessment tool, which shows the client patterns as depicted by an unconscious narrative that characterizes his/her life. The PMAI® suggests a model that can help a client develop a better understanding of the archetypal patterns that dominate their life. The PMAI® could be viewed as an instrument that measures a person’s narrative intelligence and thus reveal the story they are currently living. It works from the basis 12 basic archetypes that function in one’s life to a greater or lesser degree. What is the Myers-Briggs® Type Indicator (MBTI®)? The Myers–Briggs Type Indicator (MBTI®) assessment is a psychometric instrument designed to measure how people tend to perceive the world and make decisions. The model infers a hierarchy of preferences, which were extrapolated by Katharine Briggs and Isabel Briggs Myers from the typological theories originated by Carl Gustav Jung and first published in his 1921 book Psychological Types. Jung theorized that there are four primary psychological functions by which we experience the world: sensation, intuition, feeling, and thinking. One of these four functions is dominant most of the time. Jung also posited two basic psychological attitudes—introversion and extraversion. What is the Singer-Loomis Type Deployment Inventory™ (SL-TDI™)? The Singer Loomis Type Deployment Inventory (SL-TDI™) is a user friendly typological instrument that provides another perspective on the typological concepts originally formulated by Carl Jung. June Singer and Mary Loomis (Both Jungian Analysts) eliminated the dichotomous assumption of Jung’s typology designed a psychological scale. In the Singer and Loomis model, a person may have more than one dominant function. The SL-TDI™ completely eliminates the old forced-choice structure and uses a psychological scale. Moving Boundaries, Inc. owns the license for the SL-TDI™. 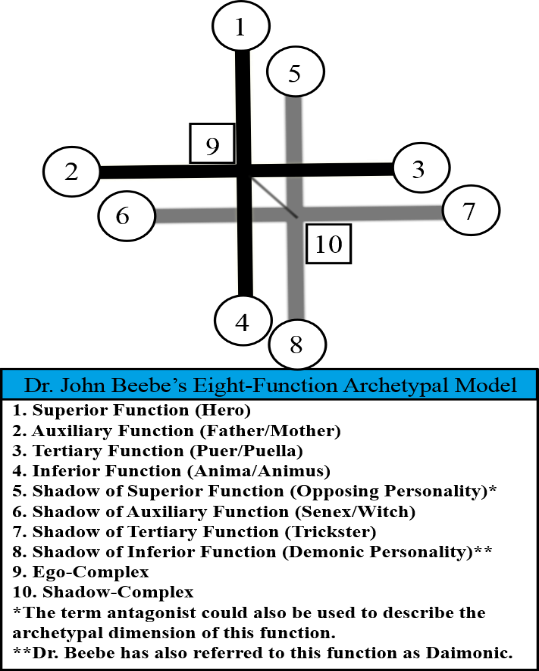 What is the Beebe Eight-Function Archetypal Model of Typology? A “extension and addition” to C.G. Jung’s original type model developed by Dr. John Beebe, which takes into account the efficacy of all eight function combinations and attributes them with archetypal qualities. Dr. Beebe’s model includes both the ego-syntonic complexes of the basic orientation and the ego-dystonic complexes contained in the shadow personality. The archetypal complexes depicted in the described model often appear in dreams, movies, and literature. See figure below. What is a depth profile™? The depth profile is comprehensive tool used to assess and model personality that I provide for any client interested in long-term personal and professional development. The depth profile is derived from the pattern analysis and information inferred from the abovementioned depth enablers. Click here to see a Depth Profile™ sample. Why do you employ multiple typological instruments? In my opinion, both the MBTI® and the SL-TDI™, have their respective strengths and weaknesses and thus, I feel that by administering them in concert with one another they both can throw a larger light on the client’s typological tendencies. For instance, from what I have seen, MBTI® is superb at describing the four of the eight functions-attitudes (the first four) but since it assumes a dichotomous model, it downplays the role of the shadow which is still operative but only unconscious. The SL-TDI™, on the other hand, can have multiple dominants which seems more consistent with how the personality works. Bottom line: I feel that both instruments provide information that when combined provides a more accurate picture of the various cognitive modes at work in the personality.